"I remember many a time when our senior generals came to us, and wrote to the defence ministry saying that they wanted certain things... If we had had foresight, known exactly what would happen, we would have done something else... what India has learnt from the Chinese invasion is that in the world of today there is no place for weak nations... We have been living in an unreal world of our own creation." Instead of "I", Nehru used the collective "we", a clear indication of his reluctance to own up his own mistakes as a man. "The fact of the matter is that Nehru felt a gnawing of conscience throughout this episode. He knew that the blame for the disaster was more his than that of his loyal friend [defence minister V K Krishna Menon]," says journalist and historian Durga Das. "The decision-making system during 1959-62 was starkly ad hoc and designed primarily to suit the personality of the Prime Minister -- who preferred to deal with these matters personally -- even Krishna Menon seldom took a stand on any point or even made a contribution when the Prime Minister was in the chair... in the Army Headquarters, it was General Kaul who had caught the Prime Minister's eye... It was not Krishna Menon who was primarily culpable for the practice of General Officers establishing direct access to politicians... It was Nehru who, many years previously, first established this irregularity," says the then director general of military operations, Brigadier (later Major General) D K Palit, in his book War in High Himalayas. After the 1962 war, Nehru wrote to General B M Kaul ('Untold Story by Kaul) lamenting about Kaul having been blamed and having had to resign from the army for no fault of his. This indicates Nehru's poor sense of judgement even after the event. Practically all military experts agree that Kaul was responsible for the debacle in NEFA in many ways. He showed utter lack of the knowledge of the higher-level conduct of war. More often than not, he was found away from his HQ flying in a helicopter personally doing things best left to his staff, while crucial battles were in progress on the borders. Though he displayed personal courage and dash of very high degree, he fully justified the doubts about his efficiency then expressed by many senior officers on account of his lack of operational experience. The roots of politicisation of the army are to be found in Nehru's hatred for the man in uniform. Soon after Independence the first commander-in-chief of the Indian armed forces, General Sir Robert Lockhart, presented a paper outlining a plan for the growth of the Indian Army to Prime Minister Nehru. Nehru's reply: "We don't need a defence plan. Our policy is non-violence. We foresee no military threats. 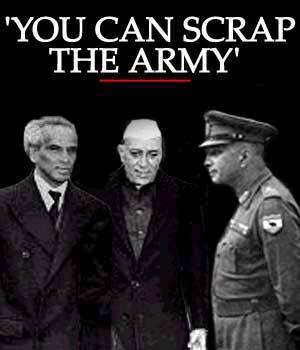 You can scrap the army. The police are good enough to meet our security needs." He didn't waste much time. On September 16, 1947, he directed that the army's then strength of 280,000 be brought down to 150,000. Even in fiscal 1950-51, when the Chinese threat had begun to loom large on the horizon, 50,000 army personnel were sent home as per his original plan to disband the armed forces. After Independence, he once noticed a few men in uniform in a small office the army had in North Block, and angrily had them evicted. It was only after the 1947-48 war in Jammu and Kashmir that he realised that the armed forces are an essential ingredient of any independent, sovereign nation. But he still wanted a compact army rather than great volume, whatever that meant. Defence requirements worked out after a careful assessment of threats carried no weight with him. For some reason, he disliked Field Marshal K M Cariappa despite his excellent leadership during the 1947-48 war that saved Kashmir. But his attempts to supersede him and make General Rajendrasinhji the first commander-in-chief of India failed when Gen Rajendrasinhji declined. Soon after Independence he separated the army, navy, and air force from a unified command and abolished the post of commander-in-chief of the armed forces, thus bringing down the status of the seniormost military chief. He continued to demote the status of the three service chiefs at irregular intervals in the order of precedence in the official government protocol, a practice loyally continued by successive governments to the benefit of politicians and bureaucrats. During the 1947-48 war with Pakistan in Kashmir, Nehru interfered with purely military decisions at will, which delayed the war and changed the ultimate outcome in Pakistan's favour. He developed a precedent to violate channels and levels of communications at that time. His penchant for verbal orders to the various army commanders, of which he kept no records, violated the chain of command. The army thereafter reversed this trend as there was no direct interference from any of the defence ministers in the army's job and Nehru was totally engrossed in his statecraft. That is until V K Krishna Menon arrived on the scene. Menon, along with Nehru, caused havoc in the army's working, disregarding professional opinion and advice, violating all channels and levels of communication and encouraging the same within the army hierarchy, which ended with disastrous results in the Sino-Indian conflict. Like his boss, Menon believed in giving verbal orders and disliked records. When the prime minister and the defence minister give an ear to a junior general over the heads of other generals, including the army chief, and the junior boasts about this, the morale and effectiveness of the senior officers is bound to suffer, even as the army hierarchy begins to disintegrate. This is just what happened progressively in 1961-62. The cancer eventually entered the mainstream services and though there are strong tendencies to counter such evils ingrained within the armed forces culture, it is slowly but surely spreading, thanks to the generally weak Indian character. After the infamous 'Jeep scandal' (purchase of Jeeps for the use of the army, which the army rejected on account of their poor condition, but was forced to accept since the Jeeps were already paid for), it became necessary to remove Krishna Menon, who had fixed that deal, from the post of high commissioner to the United Kingdom because of political and media pressure. But Prime Minister Nehru rewarded him by making him Minister for Defence with Cabinet rank. This tradition has been faithfully carried forward to date by the followers of Nehru and by politicians who vehemently opposed him and the policies of the Congress party, with equal vigour. In power and out of power, political compulsions seem to demand different ethics. It is not out of place to mention here that the government dropped the case slapped on the nondescript company that had supplied the Jeeps soon after Krishna Menon took over as defence minister. It stands to reason, therefore, that they depended only on each other for advice and everyone else, mainly the bureaucracy (as politicians hardly understood or took an interest in anything about foreign affairs, which were indeed very foreign to them), looked up to the Nehru-Menon combine for all foreign policy directives. Without any official position in the external affairs ministry, Menon was treated like royalty by sycophantic officials, mainly because Nehru looked on him with favour. Menon thus wielded a lot more power than what his official position in the Cabinet permitted because of Nehru, and received far more importance than he deserved. Senior defence services officers, who should have been part of the government's foreign policy-making body, especially as regards the border problems, were never even consulted. In fact, those days apart from the ICS, they were the only ones with international exposure and possibly the only service that had had some training in international relations. Keeping the defence services out resulted in a lame Indian foreign policy, without the backing of the required military muscle. Defence services officers are brought up to be straightforward and forthright. But having exercised their right to differ and express dissent, they will carry out the orders received to the best of their ability. It must be said to Nehru's credit that he was at least open to differing points of view. Nevertheless, he would discard them easily after giving them a hearing. Menon, on the other hand, had no such generosity. He would mercilessly stamp down hard on any kind of dissent. Military men suffered severe insults from Menon and heavy snubs from Nehru, which virtually cut communications between the military high command and their civilian bosses. Krishna Menon didn't possess an independent power base and drew his power from his proximity to Nehru. In fact the entire inner circle of Nehru, of which Krishna Menon was de facto whip, had no independent power base and drew its power from its proximity to Nehru. Naturally, its members guarded access to Nehru very carefully. Though politics was a lot more democratic and open those days and Nehru a lot more accessible and democratic than his daughter (who perfected the coterie politics) and those who followed her, the seeds of coterie politics were firmly sown under his stewardship, and in his days Menon was feared due to his sharp, swift and abrasive tongue as his chief whip. Krishna Menon probably would have done better as foreign minister, but he proved to be a bad boss for defence. He disliked the set army procedures and tried to short-circuit them at every stage in every matter. He had a bad habit of treating his subordinates as if they were children. He took an immense pleasure in throwing files at the faces of senior officers. He often liked to summon his subordinates at odd times of the night to his residence for no work of importance. Insulting people came easily to him. But the proud defence services officers refused to be cowed down. There were instances of the files getting thrown out of the office or back on the table. Some abruptly walked out on Menon without taking his permission. So, to assert the civilian superiority over the military, Menon began to play favourites, tried to supersede capable commanders with pliant, weak-willed officers, and create prot�g�s with, in all probability, Nehru's tacit approval. These officers naturally proved to be short on self-respect also and failed to stand up for their convictions when occasion demanded. Major General Palit writes in Menon's defence: "In spite of his methods such as barbed tongue, biting criticism and blatant cajolery to subvert opposition, if any army officer stood his ground, he wouldn't overrule him. The trouble was that most of his [Menon's] directions to the army were ill-conceived, ill-informed and foolhardy." But in a democracy, a majority of the government's directions, right or wrong, must prevail. Besides, Gen Palit is the only person to have defended Menon. Probably he saw his boss Kaul standing his ground before Menon, but then Kaul being Nehru's prot�g� could afford to do it. Also, Gen Palit, though working in fairly close proximity to the defence ministry and minister, appears to have been surprisingly unaware of Menon's habit of threatening officers who dared to raise genuine questions with a court-martial. Lieutenant General S L Menezes recounts this habit of Menon in his book, Fidelity and Honour. Generals Thapar, Sen and Kaul were literally forced by the Nehru-Menon combine to undertake actions that the military found unsound. But eventually trusting the judgement of intelligence chief B N Mullick and foreign affairs experts Nehru and Menon (in any case the highest decision-making body) that the Chinese were not serious about war and would not fight, these generals not only carried out their orders meekly but often with active co-operation. Kaul, who got taken in by Mullick's philosophy after initially differing with it, probably was also responsible for giving some wrong ideas to Nehru and Menon and/or strengthening some of their wrong ideas. Gen Sen, sadly, displayed no mind of his own and vacillated greatly between two extremes right to the end of the war. Finally, there came a time when these generals realised that 'an armed conflict with China was inevitable'. They also knew that our army was unprepared, ill-clothed and ill-armed and that the supply lines just didn't exist in that inaccessible terrain. If war broke out, our defeat was guaranteed. It must have also become clear to them that war meant sacrificing the officers and men under their command on their direct orders. They must have also clearly understood then that the battles they were getting forced into would bring disgrace to the nation and dishonour to the army. Yet they did not have the courage of their convictions to offer their resignations, preferring to be tools in the hands of their political bosses and carrying out a suicidal act. A mass resignation of the senior generals would have forced the government to back down and seek a diplomatic solution to the border problem while simultaneously strengthening the armed forces to take on China in high-altitude terrain. The government would have certainly gone out of its way to keep the whole matter secret, and thus there was no chance of any other risk emerging out of the episode. There was not a ghost of a chance of the acceptance of their resignations by the government, which just couldn't have risked the facts about the border conditions, poor diplomacy, and hasty demarcation of the borders without ratification by China becoming public. But these generals, indulging first in self-ambition and later in survival, forgetting that the men under their command, whom they were soon to order to their deaths, had no public voice and depended entirely on their superiors' good judgement and strong backbone for protection. General K S Thimayya was an officer with a brilliant military career. The British had always avoided giving higher command to Indian officers as a matter of policy. In such circumstances Thimayya was the only Indian officer to be made a brigadier and given command of an operational brigade during the Second World War. Later, during the 1947-48 war with Pakistan, Major General Thimayya gave an excellent account of himself. He was, without doubt, the most popular general, loved by one and all in the army. In due time he became chief of army staff. To his bad luck, that time happened to coincide with Krishna Menon's entry into the ministry of defence. Krishna Menon was a master in the art of one-upmanship, with many tricks up his sleeve. The writer Khushwant Singh has narrated many a humorous anecdote about this habit of Menon's. To get one up on General Thimayya and the military top brass, Menon employed a unique trick. On ceremonial occasions, he would often go and sit in the front seat of the car next to the driver, putting the accompanying army chief in a dilemma. How could he sit at the back while his boss, the defence minister/chief guest, was sitting in the humble front seat? General Thimayya found a diplomatic answer to this. He would ask the driver to sit behind and take the wheel of the car himself, and engage the defence minister in casual chat. Engrossed in his self-importance, Krishna Menon never grasped the essence of this tactic. Perhaps he felt elated that he was making the general drive him around, as he made a habit of it and extended this practice to all times, everywhere. The differences between Menon, the defence minister, and General Thimayya, chief of army staff, grew over the former's interference in military matters and promotions and postings of officers, as Thimayya refused to be browbeaten. There came a time when he resigned in protest (possibly on the matter of promoting Gen Kaul out of turn). Nehru worked his charm and managed to get Thimayya to withdraw his resignation, but eventually spoke in Parliament criticising the general, contrary to what he had promised. Thimayya, the soldier, who had no public voice, was greatly pained at having been let down in this manner. The episode also showed that Nehru was capable of doublespeak and could go back on his word. There were pro and contrary views on the resignation episode. Thimayya was a recipient of considerable criticism for his resignation as well as its retraction. In the bargain, the nation was the loser. When the time came for Thimayya to retire, it was expected that the brilliant commander of proven ability, Gen S P P Thorat, would be made chief superseding Gen Thapar. But the government opted for the meek and submissive Thapar, much to the disappointment of almost the entire officer cadre in the army. This animosity between the army and the civilians led to loss of interaction between the two. And in the long term, the armed forces began to get increasingly politicised, a process that continues. Civilian interference in defence matters, particularly promotions and postings, came to be accepted. There entered a most un-soldierly tradition into the services (some, not all) -- a tendency to be subservient to the bosses like junior civil officials. A tendency to toe the official line rather than display independent thinking/courage of conviction became the rule rather than the exception. Senior officers approached politicians for postings/appointments and courts for redressing their grievances. The Admiral Nadkarni-Koppikar-Bhagwat episode and the Admiral Bhagwat-Sushil Kumar-Harinder Singh episode are all offshoots of this same malaise. In the short term, pliant officers got promoted. The depressing effect of this on the previously highly promoted officer-like qualities, such as fearless expression of opinion and initiative and dash, was incalculable. The era of mediocrity was hastened in the defence services on account of the politicisation, which, to our good fortune, the services did make an honest effort to resist then and have continued resisting till date. With mixed results.